Dressing in style now has meaning; plus: Mechanically-relevant Design-your-own-clothing-engine! It’s time to get some new couture that actually matters! The second installment of the Pop Culture Catalog-series clocks in at 29 pages, 1 page front cover,1 page editorial, 4 pages of SRD, 2 pages blank, leaving us with 21 pages of content, so let’s take a look! Okay, as the size of this pdf should show you, we have a longer installment on our hands – but one that is based on the same rules-framework as the first installment, i.e. it uses the fandom rules: the base rules for joining a fandom are reproduced on the first page: In order o join a fandom, you must have immersed yourself in the fandom’s topic for at least 24 hours, which must not be consecutive (indeed, increments can’t be more than 8 hours). Once you’ve immersed yourself, you declare that you’re a member and that’s it. You can belong to a total maximum of 1 +Charisma modifier (minimum 1) fandoms at a given time, and you may leave a fandom at will, losing access to the perk it grants. Re-entering a fandom only takes 12 hours. Additionally, for every 5 ranks in a skill associated with a given fandom, you may join a fandom associated with that skill; For example, Infosphere series fandoms may be unlocked via Computers or Culture, Clothing Brands via Culture or Profession (fashion designer) – you get the idea. Now, I mentioned the fandom perk – this is basically a minor bonus, not unlike one of the benefits granted by a theme. Being in a fandom nets you the fandom perk, but you only can have one active fandom perk at a given time – each time you take a 10-minute rest to regain Stamina Points, you can choose a fandom perk to be active, which renders a previously chosen perk inactive. Additionally, you can spend 2 Resolve Points to spontaneously switch your active fandom perk as a full action. So far, so simple – as before, the first section of this pdf allows Alexander Augunas to show off that he is not only an experienced technical rules-writer, but that he also knows how to create flavorful fluff. Basically, we’re introduced to an assortment of megacorps/brands associated with clothing etc., and once more, this made me smile: Basically, all of these do, in some way, lampoon real world companies – and while I am not a specialist regarding brand clothing (consider me to be more on the side of Macklemore’s sentiments and usually opt for a goth/metalhead version of smart/business casual, but I digress…), even I managed to identify quite a few of those companies. This is made easier by a continuation of an aspect of the first pdf I adored, namely the fact that we get company logos. Alucci, for example, does look a bit like a famous manufacturer that also ends in –cci IRL. Interesting here would be that the respective entries offer more meat – each of the companies comes with a manufacturer line that, for example, notes when the item’s Hit Points are increased in comparison to regular versions – and notes on price. While, for example, Alucci’s luxury goods all get the formal clothing property, they also cost no less than 10,000 times (!!!) the normal price. The perk does give you an edge in contested skill checks and instills you with confidence, which increases the DC to use social skills versus you. Wait a second. Properties? Yep, but I’ll get into that below – just note for now that clothing properties do exist….but not all companies herein necessarily tie into that: Approu cosmetics, for example, help you keep your fur, scales or skin in tip-top shine, and actually net you a bonus to Fort-saves to withstand environmental effects – and they help you pass for a young adult of your species! As the perk, you can choose a culture and gain minor bonuses to social interactions here. Are you really sick of your shpaeshifting wrecking your favorite suits and dresses? Fed up with statiching that blouse? Well, it’s time for Casuqolo clothing – designed from shifting-friendly nanofibers, it finally allows you to remain comfortable, regardless of your form of the day! Moreover, if you’re really immersed in the fandom, you may use them as a substitute disguise kit; in conjunction with a proper disguise kit, they further aid you. Cool! Hims and fems is professional wear, obviously based on H&M, and is an inexpensive means to get socially acceptable wear; if you’re a fan, the utilitarian nature will help you with emotion and fear-based effects – which makes sense in the everyday professional world. The North Star is outdoor wear for the distinguished spacer, with life-support systems and if you enjoy the pretty famous founder’s myth, you may benefit further from protection vs. environmental effects. Want to make a statement regarding class ans style that can help you with Intimidate and Diplomacy? Ruidi. You know, like the famous movie, “Osyluths wear Riudi” – and yep, that jab got a serious chuckle out of me, particularly considering, you know, that there are actually devils in our game? XD Turri & Co is a jewelry manufacturer synonymous with quality silver and diamond jewelry, while under glamour wear can actually make you harder to detect by creatures with scent-based blindsense! Cool! Victoria athletic wear is based on Nike, and allows you to reroll a single d20 roll for 1 Resolve Point if you’re a diehard fan – after all, you “Go for it!” Finally, there is no way past the hilariously-named Wreekt watches; obviously based on Rolex, these are just funny and can be really useful communit standins. 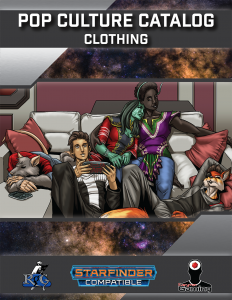 Now, beyond these brands, the pdf goes much further, in that it covers racial clothing: Not only for the core races, mind you – but far beyond that: We do get notes on Alien Archive creature clothing, the races introduced in the Starfarer’s Companion are provided, and even beyond that – from arichs to gnolls, even a plethora of races from the Star Log.EM-series is covered! A kitsune’s racial wear, for example, obviously has to account for the race’s limited shapeshifting and is also silent in comparison! Bodywraps, digitigrades footwear or e.g. wing sleeves are also touched upon, adding some seriously nice components to this pdf’s components. Races without their own clothing traditions are, just fyi, covered as well, which just adds some icing on the cake. So far, we have an amazing flavor-centric pdf here, but it’s time to talk about the details here – the properties, and, in a way, the beating heart of this supplement: You see, I learned this lesson relatively late, and it’s not one that many RPGs talk about – but here goes: Clothing matters. This pdf allows you to drive this home and provides a surprisingly mighty engine for making your own brands, your own clothing. First, we choose a general 10 types of clothing that includes anything from pajamas to uniforms – all come with a proper item level, price and bulk-note, handily collected in a table. Similarly, clothing manufacturers are noted with prices and item levels and types they generally put out – and page-references for your convenience! The pdf then proceeds to provide price multipliers by item level – and then, we get the massive list of clothing properties; with the exclusion of the Athletic property, all have a price noted and a description of the effect – as an aside, it is evident from context that a price of 10 credits makes sense for Athletic wear. From costumes to hodgepodge hipster wear to intimidating or durable pieces of clothing, these may have circumstantial benefits, but they matter. There is a reason to get them…and having a LED, for example, can be a true boon; same goes for nanofiber datasets. Filters that help cope with toxic environments, and porter clothes actually help you carry more! There is a reason that baggy palming clothes are popular with criminals – they make Sleight of Hands easier! And proper sleepwear helps you recover from the rigors of adventuring! Editing and formatting are very good on a formal and rules-language level – apart from the one price-section missing, or e.g. a missing blank space, I noticed no issues. Layout adheres to the series’ two-column full-color standard, and the pdf sports quite a lot of nice original artworks in Jacob Blackmon’s signature style. The pdf now comes fully bookmarked for your convenience; if your version doesn’t yet have the bookmarks, redownload it. I love Alexander Augunas’ Pop Culture Catalog-series. The series’ focus on rewarding actually ROLEplaying your characters is great – if you make your character more than just a guy or gal defined by combat prowess, this really helps doing so. Roleplaying fans of certain brands allows for differentiation between characters, and the fact that the choices actually matter provides further incentive for doing so. In short, this rewards you for engaging with the game on more than its combat level. The brands herein also add some serious color to the setting – when you think of e.g. Shadowrun and similar franchises, you’ll soon note how important and useful branding can be for in-game consistency, for roleplaying. And then, there’s the fact that this one’s clothing-design engine is seriously nice and allows you to get creative. Beyond this, it should also be noted that this lays the foundation for magical clothing, and that this also could be considered to be extra useful in a game wherein the magical aspect of Starfinder is deemphasized. If your scifi/space opera tastes run parallel to mine, you’ll enjoy the intrigue and fine customization options that this one offers – all without unbalancing the game. All in all, this is a great continuation of the series, one that makes me truly happy that this series exists. Final verdict? 5 stars + seal of approval. Check it out, and perhaps, use it to jumpstart your own interstellar clothing empire! You can get this cool, flavorful supplement and make your own garments here on OBS!